Winter is most definitely upon us. The days are so very much shorter and the seas so very much bigger. Be sure to check out all that is being organized within our community as far as activities and cultural events. The groups and individuals that are producing them deserve your support. The West Coast Winter Music Series returning for its 10th season starting Saturday November 7 with Legends and Ballads with Liszt, Ravel and Chopin featuring Terence Tam on violin and Lorraine min on piano. The series will continue with Borealis String Quartet on Friday January 29, Red Chamber Ensemble Saturday February 20, Jazz evening with Phil Dwyer on sax and Ken Lister on bass on Saturday March 13 and an evening of tango with Linda Lee Thomas and Jonathan Goldman on Saturday April 10. Passes for the series can be purchased for $85 or tickets for individual shows can be purchased if space is available. For more information contact Judi at 250.725.3373. The amazing annual Oyster Festival will be starting on Thursday Nov 19. Unfortunately the Gala on the Saturday night is sold out as always but there are plenty of other happenings to join in on. Join the fun in costume for the Mermaid's Ball! Featuring the Oyster Pit with raw and bbq oysters, live music, oyster slurping contest and prizes for best costume! Dance to the live tunes of the Banana Fish Dance Orchestra. Costume pieces are available at Castaways. The Winter Celebration Arts and Crafts Festival will be happening once again Sunday December 13. This fantastic annual event has something for everyone from warm fuzzies to sweet treats. For information on booking a table and presenting your wares contact Jennifer Scott at 250.725.3911. 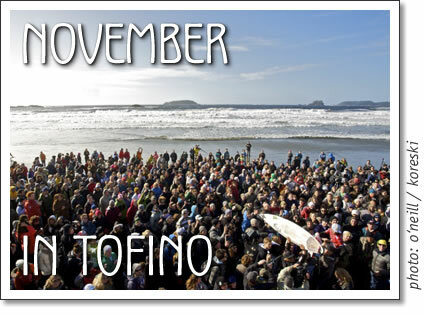 Tofino in November. Published in the November 2009 issue of Tofino Time Magazine.